USANA, word! : Are you the one in two that has osteoarthritis – and doesn’t even know it? We all know that with age and after the knocks and accidents that go with high-intensity sport, your joints can get a battering. But it can also trigger the chronic (long-term) condition osteoarthritis, a condition that affects an amazing number of people – including young people. Although common in older people, the beginnings of the condition can affect people much earlier according to an expert from Sydney University. Your joints are the point where two bones meet and they allow flexible movement – think of them as being your body’s hinges. To protect them and maintain suppleness, joints contain fluids and other substances that cushion the area keeping the bones separate. But over time, and as a result of injury and other factors, the protective substances can erode. The result is a condition called osteoarthritis (OA). Symptoms include pain or stiffness after sitting or lying down for some time and mild and/or occasional joint pain and stiffness. This can progress to more frequent and severe pain with affected joints becoming increasingly difficult to move. The muscles that usually move the joint get tighter and shorter as they you use them less and less and it becomes more and more difficult to straighten the joint. So what can you do? Treatments for OA include a healthy diet (getting to a healthy weight range is essential as it takes a massive amount of pressure off the joints, especially weight-bearing joints like the knees and hips). Other research suggests that eating too many fats may contribute to the inflammatory response that is the key to this painful condition. Enjoying plenty of fruits and veggies is important because not only can they help to fill you up leaving less room for fatty/sugary foods, but they are also rich in antioxidants which fight free radicals associated. Research has also shown that affected joints contain large amounts of free radicals. Exercise that keeps your muscles and joints moving (such as low-impact walking and swimming are good choices). You could also try the unique and popular Procosamine® contains glucosamine and the potent anti-inflammatory effects of Meriva® curcumin. The results of a small six month long trial called the GUIDE trial conducted in Spain and Portugal, measured the effects of a 1500mg daily dose of glucosamine sulphate against a 3000mg daily dose of the analgesic (pain killer) acetaminophen (paracetamol) or placebo in 318 people with knee OA. 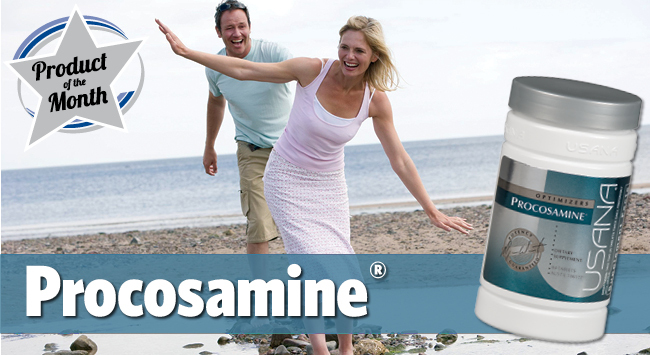 Glucosamine relieved pain significantly better than the acetaminophen or placebo say the researchers. ‘Glucosamine is a safe compound and its use should be considered in the early stages of OA,’ says Gabriel Herrero-Beaumont MD lead author of the GUIDE trial. Unlike other glucosamine supplements, the type used in Procosamine is vegetarian (it’s not derived from the shells of crustaceans so it is in the form of glucosamine hydrochloride) plus contains added potassium sulphate so you benefit from the same potency as you’ll find in regular glucosamine sulphate supplements. The potent and proven anti-inflammatory and antioxidant benefits of Meriva have been proven and it is an effective and safe anti-inflammatory in the complementary management of OA. Plus, studies of Meriva and non-steroidal anti-inflammatories (NSAIDs)i ii show decreased use of these medicines. Studies also show a clear reduction of NSAID-associated gastrointestinal problems has been seen in treatment groups. This might be due also to the reduced intake of NSAIDs, to the protective effects of curcumin, or to a combination of bothiii. 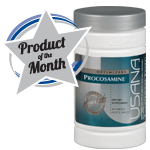 Using Procosamine: take three tablets daily, preferably with meals. Try it with BiOmega™ III which provides potent anti-inflammatory essential omega-3 fats. NB: Vitamin supplements should not replace a balanced diet. Use only as directed. Always read the label. If symptoms persist, see your healthcare professional. ii: Kuptniratsaikul Thanakhumtorn S, Chinswangwatanakul P, Wattanamongkonsil L, Thamlikitkul V. Efficacy and safety of Curcuma domestica extracts in patients with knee osteoarthritis. J Alt Compl Med. 2009;15:891-897. Accessed 10 July 2012.Available from: http://www.ncbi.nlm.nih.gov/pubmed/19678780.